If you are on the keto diet, you are probably eating a lot of chicken. It is one of the easiest foods to work with, and it provides the protein that you need. However, it is easy to get tired of the same old chicken recipes. When you are ready to try something new, here are the top keto chicken recipes that you can use for any meal of the day, including breakfast. 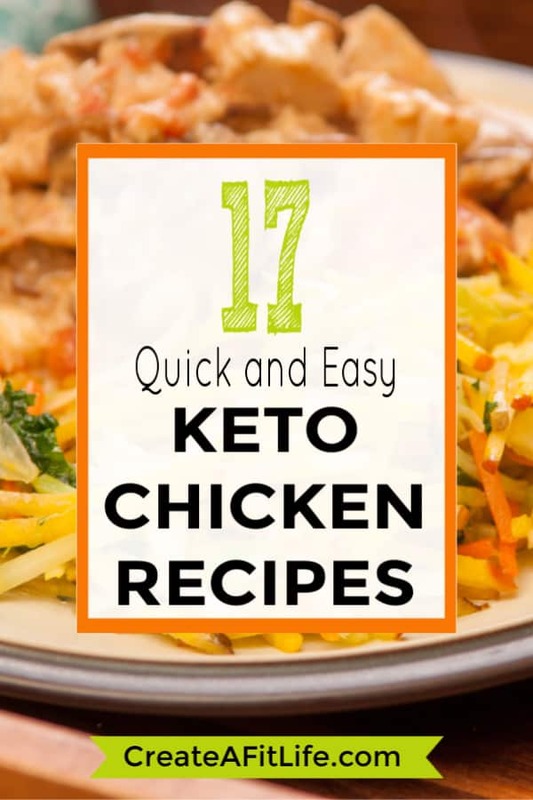 Why Do You Need Chicken Recipes for the Keto Diet? Chicken is a great source of protein. It’s also a versatile food. There are hundreds of different ways to prepare chicken, including many keto-friendly options. Besides an abundance of keto recipes with chicken, chicken is also beneficial due to its price. It is often less expensive than ground beef or steak. Most grocery stores sell bags of frozen chicken thighs or breasts at low prices, which will allow you to plan your keto diet meals without spending your entire food budget. Chicken also stores easily. You can cook large batches of chicken and refrigerate the leftovers. It should remain good for several days. The bottom line is that chicken is one of the most popular foods, and you should have no problem finding tasty recipes, starting with the following low-carb chicken recipes. Chicken and BBQ go together beautifully. The BBQ sauce helps keep the chicken from drying out. It can also be used in a lot of different recipes to create some interesting dishes. If you are in the mood for chicken, choose one of these recipes for your next meal. Pulled chicken can be used for a variety of meals. You can make pulled chicken open-faced sandwiches, wraps, tacos, or burritos. With this recipe, you should get about four servings of pulled BBQ chicken. It requires quite a few ingredients. However, most of these ingredients are used for the homemade BBQ sauce. If you like the BBQ sauce, you should save the recipe and use it for other meals that require BBQ sauce. You may want to hold on to the BBQ sauce recipe from the previous meal for this roasted BBQ chicken wings recipe. You need enough of the sauce to coat the chicken as you slowly roast it on a grill or in a roasting pan. The prep time is only about 10 minutes if you already prepared the BBQ sauce, while the total cook time is a little over an hour. If you get tired of chicken wings or pulled chicken, you can try this chicken casserole. It provides an interesting way to prepare BBQ chicken. It also calls for one cup of BBQ sauce. Again, you can use the BBQ sauce from the first recipe. You also need a lot of cheese. This recipe uses one cup of sharp cheddar and one cup of Monterey Jack cheese. The cheesy, BBQ mixture is fantastic and may become one of your favorite meals. Keto crockpot chicken recipes are great options for planning your weekly meals. You can throw the ingredients in a crockpot and allow the chicken to slowly cook throughout the day. It is also easy to prepare large batches, which should leave you with extra chicken for preparing other meals. With this crockpot recipe, the sun-dried tomatoes, spinach, and garlic help keep the chicken moist as it cooks. It also includes a creamy parmesan sauce. This recipe uses chicken thighs. However, you may substitute chicken breasts if you prefer. Thanks to the spinach and tomatoes, you also do not need to worry about preparing a side dish. This recipe provides a filling meal that you can prepare in the morning and have ready by the afternoon. Crack chicken is a name used for chicken that tastes so good that you cannot stop eating it. Very few crack chicken recipes deserve this name. However, this slow cooker crack chicken is amazing. It only requires four ingredients and can slow cook for about eight hours. You can even add some bacon bits to give the chicken some crunch or steam some broccoli to serve with the chicken. This next recipe also only requires a few ingredients. You can throw chicken, basil leaves, lemon grass, ginger, lime, and salt together and let the crockpot do the rest of the work. In fact, it may only take about five minutes to prepare this dish. However, you need to wait about eight hours for the slow cooker do its magic. Chicken Marsala is a popular chicken dish. This slow cooker recipe simplifies the steps needed to prepare chicken marsala. It tastes great on its own. However, you should consider serving with a side dish, such as grilled vegetables or cauliflower rice. If you choose cauliflower rice, consider adding it to the crockpot several minutes before serving to let it warm up. This buttery, roasted chicken provides a great solution for preparing large batches of chicken. You can add a whole roasting chicken or up to five pounds of chicken thighs and breasts in your crockpot, depending on the size of the crockpot. You should have at least six servings by the time the slow cooker is done cooking your chicken. Chicken breast contains quite a bit of meat per breast, which makes it perfect for recipes that require cubed or chopped chicken. It also tastes great as the main ingredient in various dinner recipes. With these details in mind, here are the top keto chicken breast recipes. Stuffed chicken is not as complicated as it sounds. You simply need to create an opening in the chicken breast and stuff the ingredients. With this recipe, you are stuffing the chicken with spinach, mozzarella, and cream cheese. This recipe also calls for frozen spinach. If you prefer, you can use fresh spinach, but you need to ensure that you squeeze it dry. Instead of stuffing the chicken with mozzarella, this next recipe requires you to add the cheese when the chicken is almost done. You spread the cheese on top and then broil it for several minutes until thoroughly melted. This recipe also features a great-tasting sauce that you may recycle for other recipes. Baked chicken recipes are often easy to prepare. After seasoning and coating the chicken, you simply throw it in the oven. When using this dish, you should consider trimming the extra pieces of fat from the chicken breasts. You can also cut the breasts in half. Keep in mind that this recipe does not have a tasty sauce to serve with it. You should consider pairing it with steamed or grilled vegetables, such as broccoli, which is always a great side for chicken. Paprika is commonly used for BBQ chicken recipes. It can also be used without the BBQ. With this recipe, you can easily prepare four chicken breasts with a bit of spice. Each serving contains just 2 grams of net carbs. Due to the strong taste, you should pair the chicken with a neutral flavor, such as cauliflower and broccoli. Honey mustard helps give the chicken a distinct kick with this simple chicken recipe. It is also one of only two ingredients in this recipe. Besides the honey mustard, you just need the chicken. You toss the chicken in honey mustard and allow to marinate. If possible, let it marinate overnight. The flavors will soak into the chicken. Some people prefer chicken thighs. You may also end up with chicken thighs simply because they are on sale. The following options are a few of the best keto chicken thigh recipes. The keto lemon butter chicken thighs are perfect for a family meal, especially when the rest of the family is not on the keto diet. Everyone will love the juicy, flavorful chicken. The recipe calls for chicken thighs with the skin and bones. When you are done eating, you can save the bones to prepare your own bone broth. However, you can also prepare the meal with skinless, boneless chicken if you prefer. If you do not like meat off the bone, this chicken thighs recipe may change your mind. The parmesan cheese, dried basil, and minced garlic combines to create a coating for the chicken thighs. It only takes about five minutes to prepare, which makes it the perfect choice for dinner after a long day of work. Each serving contains just a few grams of carbs. Dijon mustard is a common ingredient for coating chicken. It has a little more spice compared to regular mustard. It also pairs well with the garlic and chopped onion included in this recipe. You also get plenty of fat. Each serving contains 42 grams of fat, 33 grams of protein, and just 4 grams of carbs. If you like the taste of this recipe, you should consider making it a part of your weekly meal plan. One of the many benefits of including chicken in your keto meal plans is the leftovers. You can easily prepare extra chicken with any of the recipes discussed and use the leftovers for lunches and snacks. 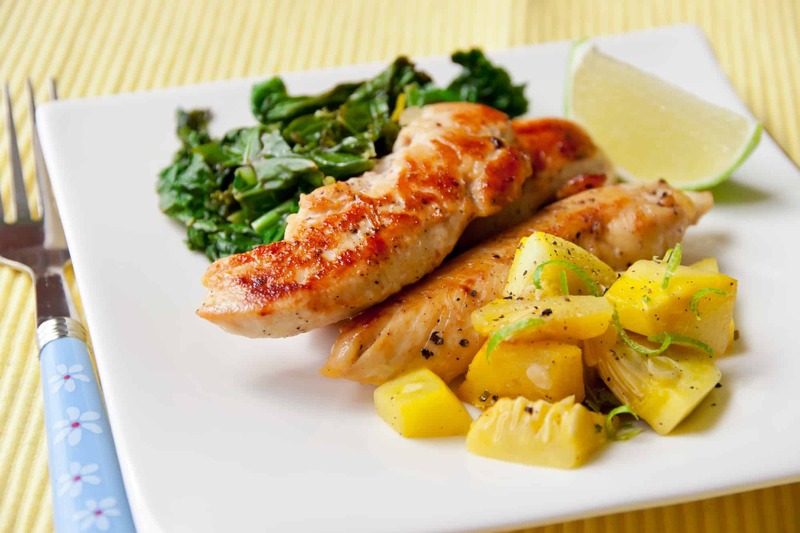 Keto diet chicken recipes are often designed to yield four servings. If you are just cooking for one or two people, do not shorten the recipe. Prepare it as directed and use the extra chicken for lunch. When you reheat chicken, it may start to get dried out. This is one of the reasons that some people do not like eating leftovers. If you want your reheated chicken to taste like it did when you first made it, you should lock in the moisture. Place the leftover chicken in a baking dish and coat with liquid. You can use a chicken broth or the liquids from the meal that it is was cooked with. Cover the baking dish with foil, while leaving a small opening in the top. You can cook the chicken at about 350-degrees Fahrenheit for 20 minutes. When it comes out of the oven, it should be hot and juicy instead of dried out. Besides reheating the chicken, you may find recipes that include chopped or shredded chicken. In many cases, you can use your leftover chicken for these recipes. An egg roll bowl is an easy meal to prepare, and you can use your leftover chicken. The recipe calls for one pound of ground chicken. However, you can simply shred about one pound of pre-cooked chicken. This recipe also includes chicken broth, so you should not need to worry about the chicken drying out. It is a hearty meal that you can have for breakfast, lunch, or dinner. This next recipe also requires one pound of ground chicken. Again, you can use your leftover chicken. If you do not have a pound of chicken, you can half the recipe and use half a pound. When you follow the keto diet, you mostly give up carbs, which includes pasta. The cauliflower rice used in this recipe provides an alternative to chicken and noodle soup. Chicken is a life-saver for keto dieters. When you have chicken, you have hundreds of options for breakfast, lunch, or dinner. Meal planning for the keto diet becomes easier when you base a lot of your meals around chicken. Besides the endless supply of recipes, there are other advantages to eating more chicken. It is inexpensive, easy to cook, and provides plenty of protein for building lean muscle. Whether you are just starting the keto diet or looking for new recipes, consider trying some of the recipes discussed. From BBQ chicken to chicken soup, there is something for everyone. With so many low-carb recipes with chicken, you have plenty of choices for your next meal.